Gaulish (νεμητον) nemeton/beside nimidas; Old Welsh niuet (nimet/nimed), Middle Welsh nyfed, Old Cornish *neved, Modern Cornish neves, Breton nemet besides niuet/nyuet; Old Irish (n. o-stem) nemed, Modern Irish neimed, and Scots Gaelic neimheadh. Celtic nemeton is frequently translated as ‘sacred grove’, though as Jane Webster (1995: 448) points out, there is ‘little indication that it principally denoted such sites’. Place-name elements and their interpretations can evolve in different social and political contexts, especially where a term is used in multiple languages over a broad time-span—nemeton being a primary example (Kilpatrick 2010). Nemeton places recorded in ancient sources were locations of pre-Christian worship, whereas by the early medieval period in some parts of Europe pre-existing nemeton sites were Christianised and elsewhere new nemeton place-names were coined with Christian connotations. 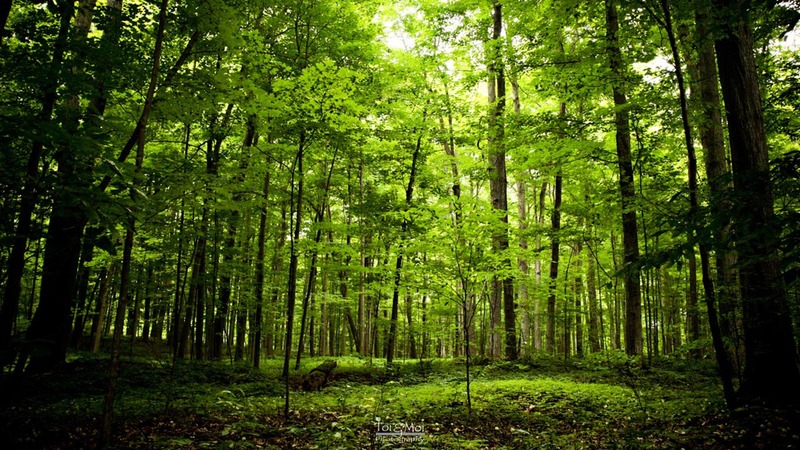 The remarkable longevity of this element—across languages, cultures and religions—indicates that the concept and spatial symbolism of nemeton must have been highly significant in early Celtic culture, and nemeton appears to have had several meanings in various languages at different stages in history. Early nemeton place-names include the following: Δρυνέμετον/ Drunemeton/ Drynemeton (near Ankara, Turkey); Nemetacum Atrebatum/Nemetocenna (modern Arras, France); Αὐγουστονέμετον / Augustonemeton / Nemossos (Clermont-Ferrand, France); Nemausus (Nîmes, France); Tasinemeton/ Vernemeton (Klagenfurt, Austria); Rostro Nemavia (near Türkheim, Germany); Noviomagus/ Nemetae (Speyer, Germany); Nεμετόβριγα Nemetobriga/ Nemetobrica (Puebla-de-Trives, Spain). The Ravenna Cosmography records a number of place-names with this element in Roman Britain, most of which are identified with Roman forts, temple sites or springs, including: Nemetobala (Lydney, Gloucestershire), Nemetostatio (Tawton, Devon), Medionemeton (on the Antonine Wall), Aqua Arnemetiae (the Roman springs at Buxton, Derbyshire) and Vernemeton (the Roman settlement at Willoughby, Nottinghamshire). The forms Vernemeton seen above mean ‘great nemeton (sanctuary or sacred site)’, and is more frequently attested from the Late Antique period. There is also evidence of deity-names derived from the term, such as Nemetona, the eponymous goddess of the Nemetes tribe who lived in the region of modern Speyer, Germany. There are a number of inscriptions and dedications to Nemetona that associate her with the Gallo-Roman god Loucetius Mars. 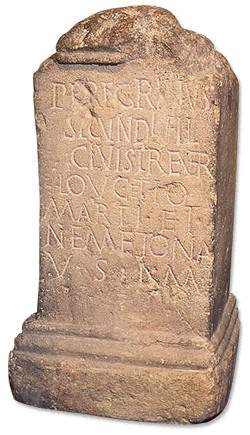 The association with Mars is also paralleled on an altar from Bath, England built by a Treveran named Peregrinus. Diana Nemorensis, one of the best documented grove goddesses was venerated at Nemorensus Lacus and her cult affords comparison with Romano-Celtic deities worshiped at nemeton sites. 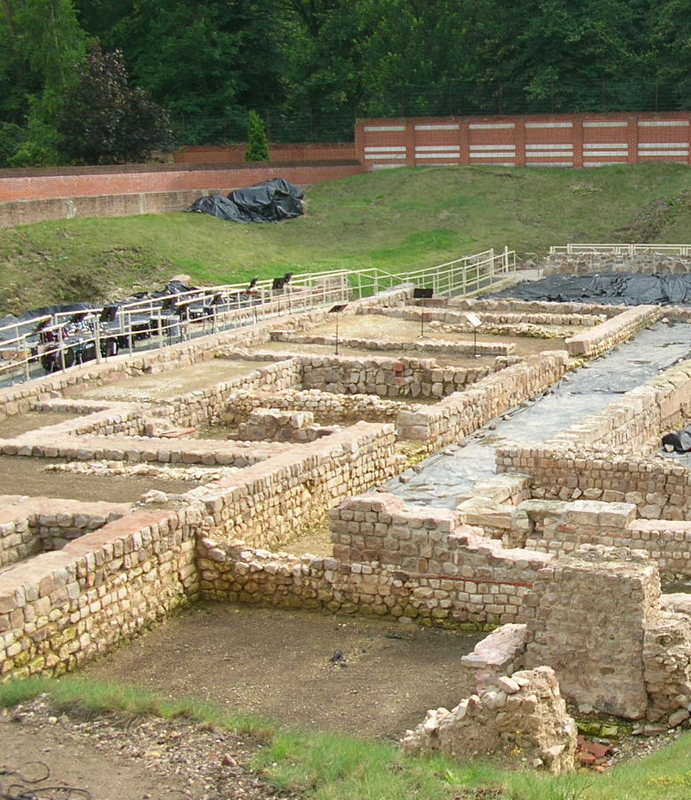 At Nemausus was an important sanctuary and sacred healing spring dedicated to the local deity from which it was named, Nemausus (itself a Celto-Ligurian name). Another example is the goddess Arnemetia, preserved in the Romano-British place-name Aqua Arnemetiae: her name means ‘before the sanctuary’. Arnemetia is also commemorated on an altar stone from Navio (modern Brough-on-Noe, Derbyshire), indicating a local cult-site to this goddess. There was a grove (nemus) from a bygone age, | never ravaged, | caging within its laced branches | dusky gloom | and icy shadows; | high above, the banished sun. | Here no rustic Pan holds sway, | no powers of the forest—Silvani or Nymphs—| but, barbarous in its rituals, | a cult of Gods: | altars heaped with hideous gifts, | every tree around them splattered with human gore. The God’s images, grim and | crudely fashioned, | started forth, rough-hewn, from felled trunks. | The very earth, | the pallor of heartwood long since rotted | down to powder, left men | thunderstruck. Divinities | consecrated in common shapes | can never cause fear | like this— | so much does it add to human terror | not to know the Gods we fear! 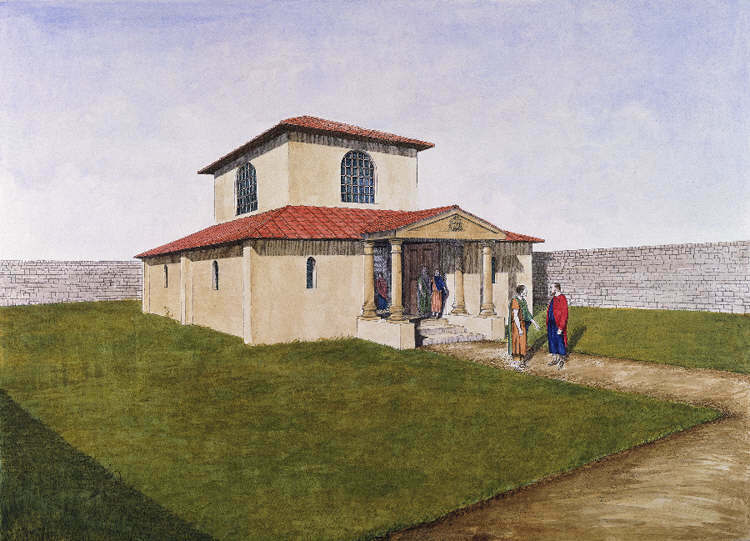 Many of the early nemeton-names may have had their origins in grove worship, but with the establishment of Roman political rule, structures characteristic of Roman religion were introduced and adopted across the Empire. Surviving place-names and inscriptions such as altar stones also help us to visualize the evolution of this term, and suggests that nemeton sites adopted certain Roman religious customs. The prefix in the place-name Augustonemeton, for example, indicates that the imperial cult of the Roman Emperor Augustus was established at this site. Since nemeton is retained in the name it is likely to have been a pre-existing nemeton site. 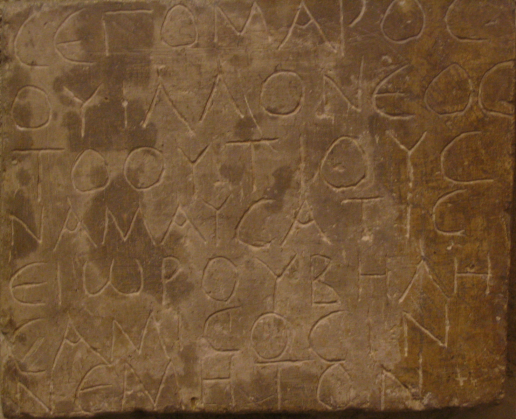 An important inscription was discovered at Vaison, Valcluse, which states that ‘Segomāros of Nemausus built a nemeton to the goddess Belisama’, and this implies the construction of some form of structure known as a nemeton. Early inscriptions and place-name evidence suggests that the perception of nemeton may have altered within a Roman context, embedding the definitions ‘sanctuary’ and ‘shrine’ in the interpretation (though this certainly does not rule out the possibility that the Celts had pre-existing shrines at these sites). Therefore, the common application of ‘sacred grove’ to describe nemeton place-names, is not so straightforward. With the decline of the Roman Empire and the introduction of Christianity, new attitudes towards nemeton place-names developed. Read the second part of Dr. Kilpatrick’s guest-post on how the nemeton name persisted into the Christian era. Keep up to date by following this blog or our twitter page. Dio Cassius, Historia Romana, ed. & trans. E. Cary, Dio’s Roman History (London, 1925). Green, M., Celtic Goddesses: Warriors, Virgins and Mothers (London, 2005). Belge d’Études Celtiques, 25 (2010), pp. 1–113. Koch, J. T., Celtic Culture (Oxford, 2006). Lucani, M. Annaei, De Bello Civili, ed. D. R. Shackleton Baily (Stuttgart, 1998). Richmond, I. A. and O. G. S. Crawford, ‘The British Section of the Ravenna Cosmography’, Archaeologica, 93 (1949), 1-51. Webster, J., ‘Sanctuaries and Sacred Places,’ in M. Green (ed. ), The Celtic World (London, 1995), 445-464. This entry was posted in Ancient Sites and Myths and tagged Celtic culture, Inscriptions, Nemeton, Place-names, Roman religion, Romano-Celtic Temples, Sacred grove, Sanctuary. Bookmark the permalink.